I blame Tatiana from Lumina Lacquer for the carton of mint chocolate chip ice cream in my freezer right now. We all know I'm in a mint phase right now, and mint chocolate chip is actually my favorite ice cream flavor anyway, so when I saw Lumina Lacquer Mint Chocolate Chip, I knew I needed it! I can't resist a polish with MINT GLITTER HEARTS!!!! Tatiana describes Mint Chocolate Chip as "a mixture of different shapes (hearts, flowers, hexes, and circle glitter) in mint, baby blue, white, and brown glitters". Happily for me, I got a lot of those cool shapes on my first try! I got a mint heart (swoon) on my ring finger, a couple of baby blue flowers (you can see one on my pointer), several hexes, some white satin stars and many other beautiful glitters. She doesn't mention this in the description, but there is a gorgeous sprinkling of iridescent glitter in this that really catches the light in person. I wanted to show this over both a creamy color and also a chocolate brown, so I went with a chocolate brown accent nail. I think the mint glitters really pop on the chocolate brown (Zoya Dea) and the effect on the creamy color is so soft and pretty. Despite being chock full of shaped glitters, Mint Chocolate Chip was easy to apply when dabbed on. Tatiana recommends dabbing with all of her polishes, as I do with any glitter-heavy lacquers. I dabbed on one coat for coverage and then went back and added some more fun shapes in the second layer. The shapes are plentiful and are not at all hard to get out of the bottle (one of the many things I love about Lumina Lacquer polishes!). Also, I almost never comment on the wear time of polishes, since almost nothing lasts more than 3 days on me, but I wore this mani for more than 4 days with no chipping and maybe a hint of tip wear. Mint Chocolate Chip is currently out of stock, but I'm sure she will restock soon. I suggest liking Lumina Lacquer on Facebook to stay updated on the latest news! Lumina Lacquer is available on Tatiana's Big Cartel store. I will have to order 1000 Julys whenever she restocks, it is GORGEOUS!! Speaking of gorgeous, check out these adorable pansies my mom bought to plant. They have extra large faces, and they are so cute!! Happy spring! This is my #1 lemming, I love it! 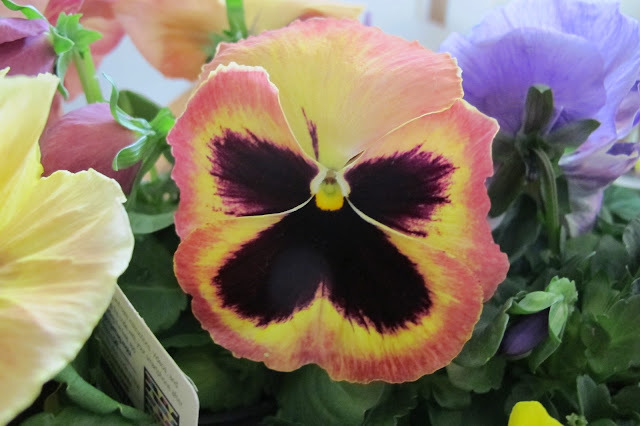 And the pansy flower is gorgeous! Thanks TikiBarbie! The pansies really are adorable! It's been so cold at night here we haven't even planted them yet, but I think we may do that today!